Horgan Keeps The RCYC Topper Flag Flying! 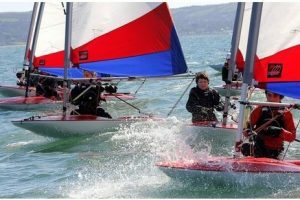 The Royal Cork was represented by nine Topper sailors at the Topper Leinsters in Skerries Sailing Club last weekend. Our strength in numbers again ensured that we had one of the largest representations of any club in the Country amongst the fleet of forty five 5.3 rig sailors. A mix of light winds and strong tides had the sailors scrambling to post some consistent results. Robert Keal started out very well on Saturday but had to bail out from the event for family holiday’s on Saturday evening. Jack O’Sullivan (KYC/RCYC) was very steady until the heavier conditions towards the end of the regatta proved difficult to maintain enough consistency to get on the leader board. Mia Murphy left it all too late finishing with a bullet on the last race, but not enough to get in to the prizes. Jennifer O’ Shaughnessy was next up followed by David Jones, Ben O’ Hare, Conor Walsh and Conor Aherne. One sailor who enjoyed consistency throughout the regatta was Conor Horgan who finished 5th overall and 1st Under 14. Congratulations to Conor and indeed all the Royal Cork sailors who competed in the event. Next up the Irish topper nationals which will kick off next week and which will be hosted by the Royal Cork. We are looking forward to a great event with large numbers from all over Ireland entered at this point and look forward to welcoming every visitor.